Clean, Refreshing, and Adventurous, Hangar 24 Brewery Brings This Mexican Style Lager to Arizona in June of 2018. Just in time for the summer pool and lake season, Hangar 24 is bringing its newest addition to an already solid lineup of core and year-round beers in Arizona. An adventurous take on Mexican-style lager, Aventura, with a touch of sea salt and fresh Southern California limes, will make its Arizona debut at a series of introductory promotions beginning in June of 2018. 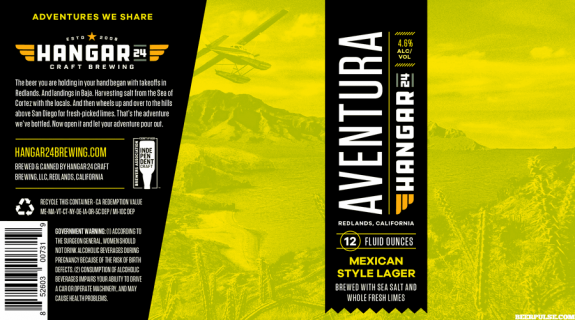 Aventura takes the Mexican-style lager on its own adventure. Brewed with salt directly from the Sea of Cortez in Baja, Mexico, and whole fresh limes from Fallbrook in San Diego County, this brew is the perfect lager to explore. Light in color and body, the malty sweetness of the base lager is perfectly balanced with salt and just the right hint of lime. This classic combination produces a crisp, clean, thirst-quenching beer perfect for warm weather, or wherever adventure might take you. Hangar 24 and Hensley Beverage Company invite the Arizona craft community to join them in series of launch events, held at some of our favorite craft beer hot spots across Arizona. Make sure to stop by and enjoy this innovative and refreshing new addition to Hangar 24’s year-round lineup- trust us, you won’t be disappointed.